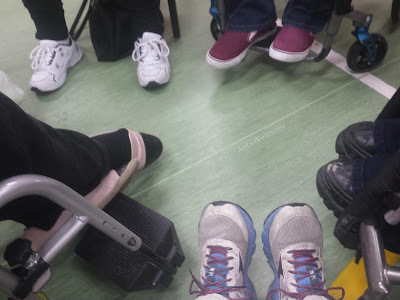 Just a quick note to let those in the Mid Central region that there is going to be a Disabled Person's meeting on Tues the 25th July from 10 am till 12 noon at the Easie Living center on Main St. Just a bit of a get together to discuss the upcoming Enabling Good Lives forum on August 1st. This should give some clear direction as to what the community wants to see in their Leadership Group before heading in to the EGL forum.Be good to see you there! It's been a full on week! Life is always interesting and more so when you tend to speak up for yourself and those you identify with and this week I've learnt that it a big way. Sometimes, even though it feels sometimes you're talking to yourself, people are in fact listening. 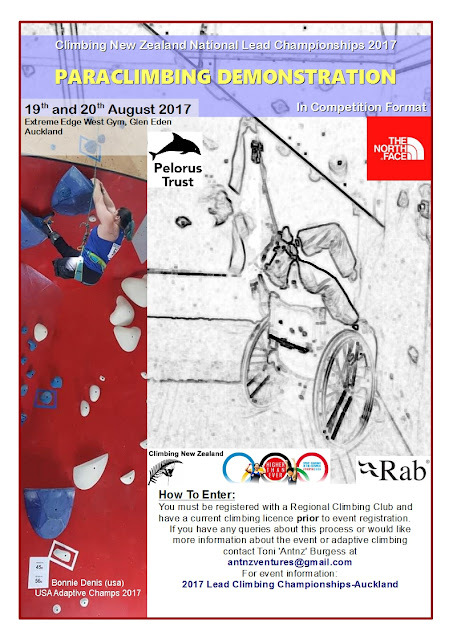 On Monday I received word that after years of asking Climbing NZ will host some paraclimbing at the Lead Championships in Auckland on the 19th and 20th of August. Woo hoo! Then I realise that is only a few weeks away, my heart sank as I realised that I would be incredibly hard pressed to save enough to actually get to the event. I put a quick post on Facebook about how exciting it was to have this opportunity, but I was disappointed that I may not be able to attend. This was shortly followed by some messages from one of my followers that would be prepared to sponsor me to attend the event. I am still absolutely blown away and hugely grateful that someone would do this for me.